Altana is nestled nearly 400 meters (1.312 feet) above the impressive volcanic basin, at the very top of the historical settlement of Imerovigli. Imerovigli is one of the most picturesque and traditional Villages on Santorini. It is also one of the most upscale locations on the island of Santorini preferred for accommodation because of its quiet surroundings and traditional, relaxing ambiance. 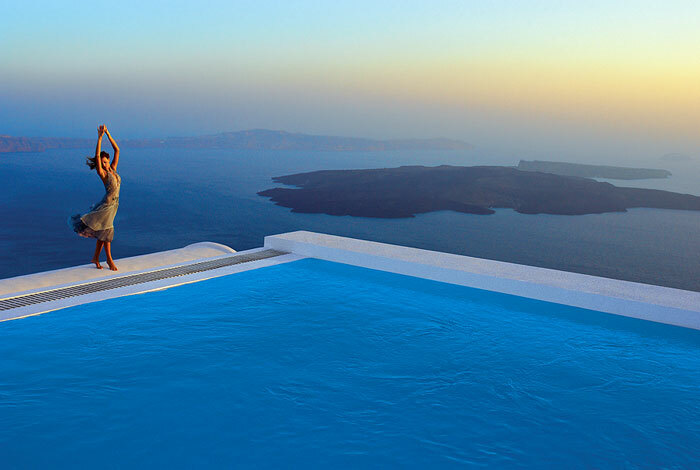 Imerovigli’s non-commercial character appeals to travelers who want to sample a genuine experience of Santorini and soak-in its magical views from the highest point along the island’s caldera. Altana, built into the volcanic rock, gracefully rests on the highest point, at the foremost tip, right in the middle of this picturesque village on the spectacular Caldera. The area of Imerovigli is the highest inhabited part of the island; perched on the highest edge of the volcanic crater we call the ‘Caldera’. In fact, the name of Imerovigli means ‘the Day Watch’. The name is derived from the words ‘Imera’ that means ‘Day’ and ‘Vigla’ that means ‘Observatory’. Imerovigli indeed served as an observatory for hundreds of years. Imerovigli, because of its position high up and towards the center of the island, allowed a lighthouse view of the whole island and surrounding seas. This made it a perfect vantage point from which to observe approaching pirates and other raiders and as a result prepare for incoming threats and protect naval merchant routes. It thus provided the ideal space for the emergence of the Castle and fortified city of ‘Skaros’, prominent during the Venetian times and capital of Santorini until a series of earthquakes in the 1800’s resulted in the Castles complete collapse.